It&apos;s hard to read the news about Palestine and not feel a little hopeless. Words often fail to capture the difficulty of civilian daily life in the war-torn area. It&apos;s odd, then, to think that music might be a real solution to some of Palestine&apos;s gravest issues. "Situation in Palestine is very hard for everyone. Mainly, people here are angry, and tend towards violence easily," Ahmad Al&apos;Azzeh, a nonviolence trainer and field coordinator for Musicians Without Borders, told Mic. But the best way to relieve that distress those citizens feel may not rely on words at all. To heal Palestine, Al&apos;Azzeh and the Holland-based NGO he represents, are using music. Guided by the mantra "war divides, music connects," the organization is having an inspiring impact — especially on the nation&apos;s children. 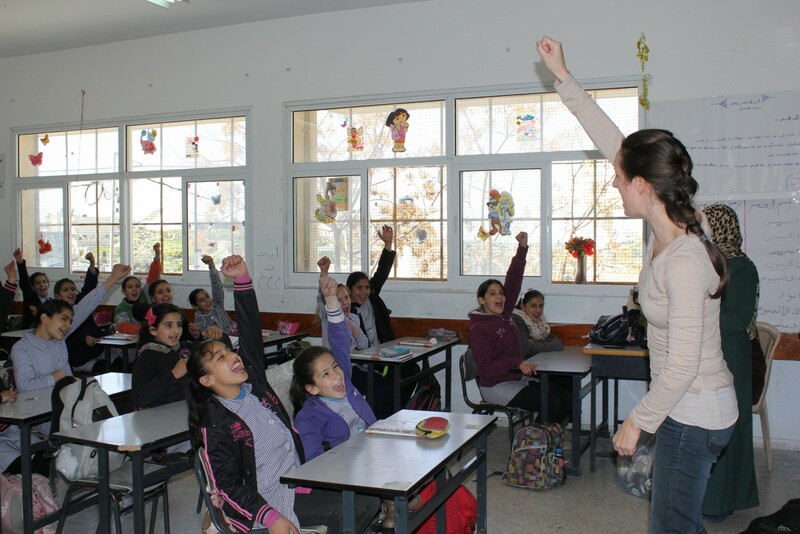 Musicians Without Borders, an international organization, works in refugee camps across Palestine, hosting music workshops and leadership training programs with children and adults. They&apos;re not a political organization. Though Palestinian refugee camps mostly arose in the 1940s after the creation of Israel, Musicians Without Borders is not pushing a broader agenda. They merely attempt to support vulnerable communities and offer training in nonviolent forms of protest and expression. Their programs often redefine the way young kids in refugee communities approach music, as most schools in the camps do not offer music instruction, and communities don&apos;t generally have money to buy their own instruments. "The children see lots of violence; they experience lots of violence," Fabienne van Eck, the organization&apos;s project manager and music trainer, told Mic. "Many many children have a family member in prison. Especially in the camps they experience many night raids of the army, teargas attacks during the day, rubber-coated bullets, live bullets — they all experience it. "There are not a lot of safe spaces where they just enjoy themselves or be creative or feel safe to express themselves. So that&apos;s what we&apos;re trying to give them during the music workshops — a place to feel safe and be creative." Van Eck shared a story about a kindergartener who had never spoken in class until he had a few weeks of music lessons, and then began to sing with the rest of his peers. Parents and teachers report they see changes in the children almost immediately. Children are happier, more relaxed and optimistic. This motivation is invaluable because Palestinian youth are so often faced with discouragement. That sense of openness and comfort has a broader mission: To raise a new generation of Palestinians ready to support and challenge their communities. "With these kinds of techniques you help to give young people a voice, or an ability to say what they feel, to bring their voice out. In that sense it&apos;s very empowering" Laura Hassler, Musicians Without Borders&apos; founder and director, told Mic. "You&apos;re also helping to support people who are in that way then contributing to working for social change through their music." They intuitively grasp music&apos;s social power. When taught to write music, van Eck finds the children frequently gravitate toward writing about freedom, prisoners or social change. She shared a song a group of children in the organization&apos;s Deaf & Proud program recorded with the help of some local rappers in Musicians Without Borders&apos; studio in the Dheisheh refugee camp. It&apos;s a powerful take on the discrimination that people with special needs face — a model for resisting with your voice and your words. "We try to make the children more resilient. Because we cannot avoid that most of the boys, for example, will go to prison one day, sooner or later," van Eck said. "But we can try to make them more resilient, so when they will be in prison they will be do better with it, or with any other challenge in their life." "The main point when you work with kids is not just to teach them what to do, you need to enlighten them, to make them feel part of the country, to make them produce something to change and rise among their people surrounding them," says Muhammad Azmi from the Dheisheh camp in a video discussing their work. In other countries, Musicians Without Borders uses their programs to unite divided groups, such as in Kosovo, where their tremendously successful Rock School allows ethnic Serbs and Albanians to meet in a neutral space to create music. However, this exchange is simply not possible to create between Israelis and Palestinians, the program&apos;s organizers say. The tensions between the people are too high, their misunderstanding of one another too entrenched and the differences in the quality of life too radical. "The ground is not ready for it. It&apos;s not going to help anything. It&apos;s not going to change anything," van Eck said. "We prefer to focus on the small things that we can change to make the country ready." And Musicians Without Borders does this by standing with the children, showing them how to stand up for their rights in productive ways. Music has always played a major role in all of history&apos;s greatest nonviolent protest movements, as Hassler points out. Just look at the civil rights movement in the United States, the anti-apartheid movement in South Africa or Estonia&apos;s singing revolution. Music can truly change the world.